Buy organic heavy cream if you can. It's a far superior product. Use whipped cream within 5 days – it tastes best fresh. Using the vanilla bean powder is optional, but I highly recommend it because it imparts an even better vanilla flavor to the whipped cream, and also gives the whipped cream those lovely dark vanilla bean flecks. 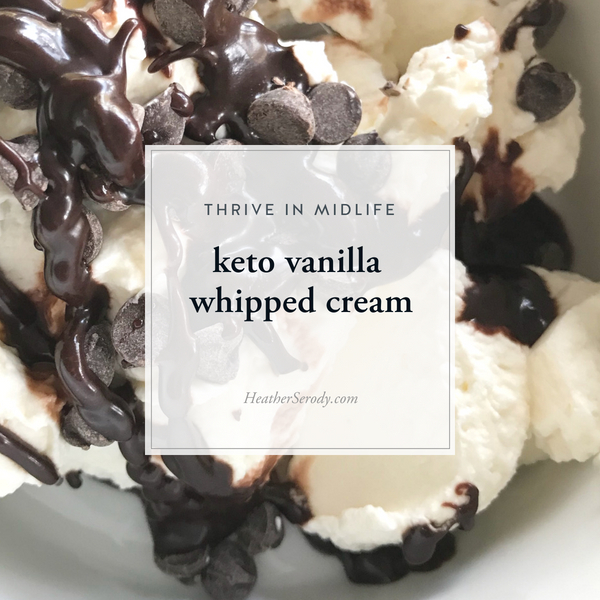 You can use the vanilla bean powder in your keto vanilla ice cream, too. Add 1 tsp of the simple syrup, vanilla extract, & vanilla bean powder to the whipped cream while the machine is running. Stop the machine, scrape down the sides, and mix again until thoroughly incorporated and the cream stands up in peaks. Serve immediately. You can also store the whipped cream covered tightly in the refrigerator until ready to serve. Note: Heavy whipping cream approximately doubles in volume when whipped, so 1 pt. (2 cups) of whipping cream will yield about 4 cups whipped cream. To save 25%-50% off Amazon & retail prices for your keto pantry supplies, I recommend shopping through Thrive Market.